Would you like to help improve maps? Use OSM Notes.Locus	Would you like to help improve maps? 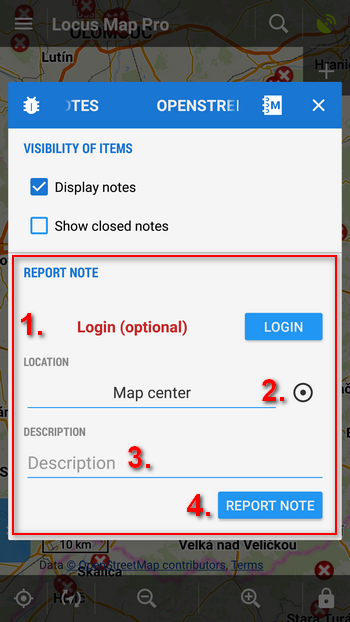 Use OSM Notes. Would you like to help improve maps? 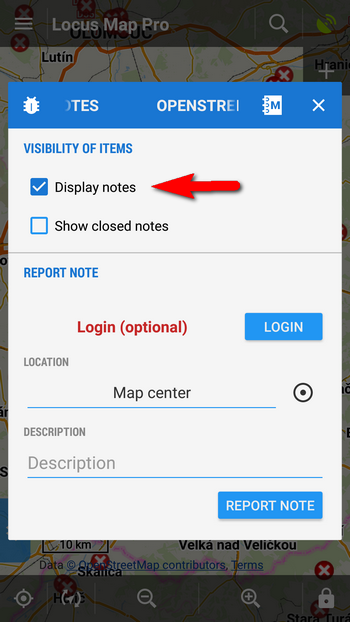 Use OSM Notes. OpenStreetMap project is one of the fastest growing World mapping platform. More and more providers use OSM data when creating and enhancing their map products, including the greatest World cartography publishers. As you know, OSM is a crowd sourced project co-created by thousands of volunteering mappers all over the World who contribute to the OSM by adding new information or improving its accuracy. 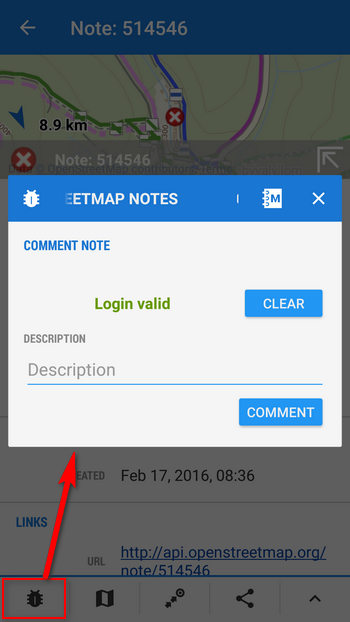 Tapping it opens a dialog where you can turn on displaying OSM Notes on your map screen. Notes are displayed as red markers on the map (of course you have to be online). Tapping a marker pops up a label with the Note number and point menu. Tapping again opens the Note detail window where you can read its description, check time of its creation and coordinates. When you tap the “bug” button in the bottom left corner, you can add your own comment to the note – correct information it displays, add you own description of the situation etc. How to add a new Note? 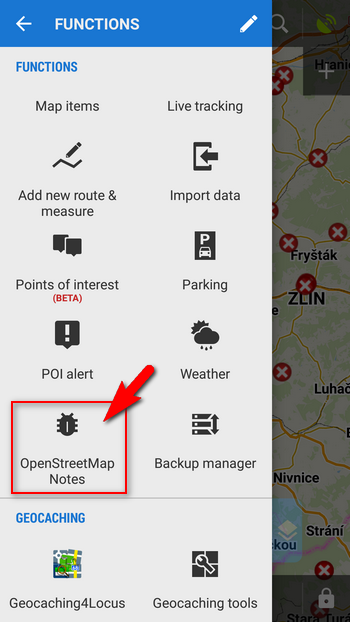 Now that you are familiar with Notes, try it out, and help improve the data on OpenStreetMap. If you are new to OpenStreetMap project, visit either their website or Wiki knowledge base. The parameters distance, accurasy and time are not enouth. Wenn i change the transport mode x times i must change manual the profil. I miss a velocity depenting track recording! Can you add a neu profil with a add new paramter for example 1-10 (1-100). In depents of the parameter the track recording take only a few points or many points also speed depenting.There can be set a progressive parameter to calculate the track intervall. Example: If parameter 1 is set, go with 5 km/h take all 100m a point, to fly with a plane take all 10000m a point. If parameter 10 is set, go with 5 km/h take all 10 m a point, to fly with a plane take all 1000 m a point. 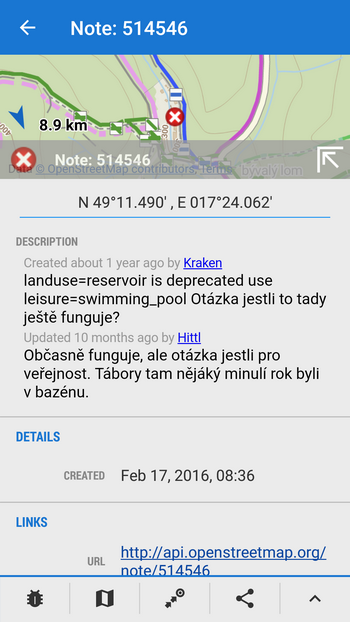 http://www.locusmap.eu/de/would-you-like-to-help-improve-maps-use-osm-notes/?utm_source=application&utm_medium=Locus%20Map%20Pro can’t realy used with mobile phone. The capch has malfunction. Hi Detlef, thank you for the idea but we are not going to change the method of setting track recording – it is highly improbable that an ordinary Locus user will record his track on a bike and plane at once. The article about OSM Notes has been fixed – German translation was missing. Thank you for the notice. I’m sorry, but I cannot understand this message. That’s why I cannot imagine what OSM notes could be. Can anyone help and explain this? Sorry Walter, the German translation wasn’t available until now.